French President Nicolas Sarkozy's UMP party says it will press ahead with wide-ranging reforms, after winning a majority in parliamentary elections. Although the centre-right UMP failed to secure a predicted landslide, it said it had a mandate to implement change. Its plans include tighter immigration laws, tax cuts and longer jail terms. In a surprise move, former Socialist presidential candidate Segolene Royal announced her split from her partner, party leader Francois Hollande. "All couples have their difficulties, and we have had ours. And now we are moving on to a new phase," she told French radio. The revelations are expanded on in a book to be published by Ms Royal this week, in which she says Mr Hollande was having an affair and that she had asked him to leave their home. The two have four children together. In the book, Ms Royal also says she plans to stand for the Socialist Party leadership in 2008 when Mr Hollande's mandate ends. President Sarkozy's party fell far short of the landslide win predicted for it in the second-round vote. The UMP won 314 seats in the 577-member assembly, while the Socialists won 185. Voter turnout was low, at about 60%. Analysts say Mr Sarkozy's first task will be to work out a cabinet reshuffle, after the defeat of former Prime Minister Alain Juppe, who was made energy and environment minister in the new government. 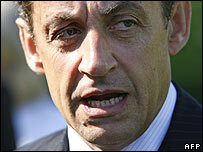 But the win gives Mr Sarkozy enough room to start pushing his reforms through parliament. The president has promised to give universities more autonomy, impose tougher sentences on repeat offenders, tighten immigration, make labour laws more flexible and reduce taxation. Prime Minister Francois Fillon said the result gave Mr Sarkozy a strong mandate to introduce his reforms. "We are going to engage in renewal, we are going to experiment with new ideas, we are going to enhance the status of work, we are going to encourage talent and innovation, and we are going to free ourselves from the defeatism which is suffocating the republic," he said. The UMP and its allies' majority is smaller than the 359 seats they held in the previous parliament, when Jacques Chirac was president. The number of seats held by the Socialists and their allies was up from 149 in the previous assembly. The centrist Democratic Movement, founded by presidential candidate Francois Bayrou, won three seats. The far-right National Front party did not win any seats. The leader of the Socialists, Francois Hollande, said the result was "good for the country". "The blue wave that had been predicted... has not taken place. In the new assembly, there will be diversity and pluralism," he said. He also described the result as an indictment of "unfair measures" set to be introduced by the UMP such as raising sales taxes from 19.5% to 24.5% to finance healthcare costs. The Socialists' results are a relief to the party, which has been riven by infighting since its candidate, Ms Royal, lost the presidential elections in May.